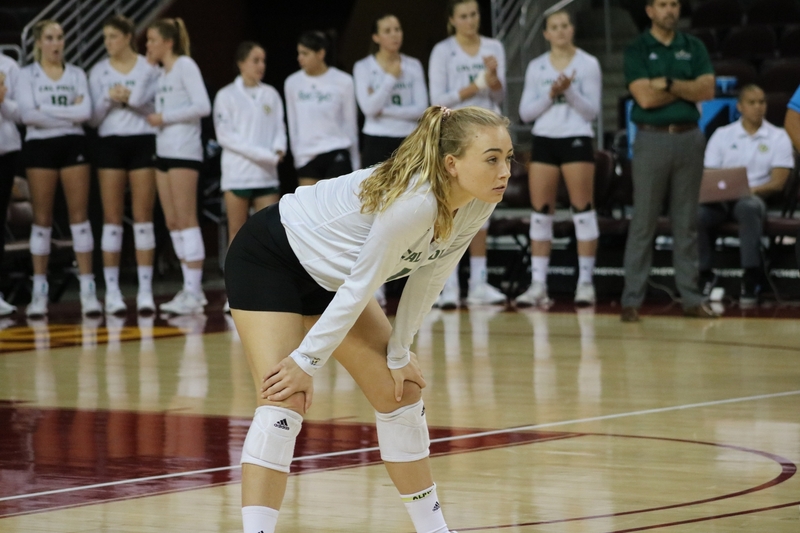 Senior outside hitter Adlee Van Winden has dominated on the court ever since her freshman year recording a total of 1,560 points for the Mustangs. The Napa, Calif. native did not miss a single set in her four-year career at Cal Poly. Mustang News: What is it like watching the team turn around to win back-to-back conference championships? Adlee Van Winden: It’s so cool to compete at that high level and to see all of our hard work pay off throughout the year, and years past too, so I think we have a really amazing opportunity and I’m really excited to see how we compete as a team. MN: How special is it to be able to play alongside your sister, junior outside hitter Torrey Van Winden? AVW: We’ve played together since we were [9-years-old], so it’s really no different than anything else. She didn’t practice today and it was weird, so it’s very comfortable for me to have her on the court. MN: What was it like to play by yourself for two years of collegiate volleyball before Torrey transferred here? AVW: I think we grew a lot as individuals. I think together we kind of played it safe. We each had our roles and we kind of balanced each other out nicely. Not being with Torrey made it uncomfortable and I feel like you grow in those uncomfortable situations. So I grew a lot, but having her back makes my job a lot easier. MN: What was your favorite moment at Cal Poly? AVW: The Hawai’i game at home last year. Our first two years, we had maybe 250 fans on a good day, so to see that kind of school spirit come to you is just really rewarding, and in coming out with a win on top of it, I think we created a nice fan base for ourselves. MN: How have you grown into your role as a leader of the team? AVW: I enjoy that role. I’ve always taken it on and I think it’s kind of fun. I think that sometimes there’s a lot of pressure, but the great thing is that I have teammates surrounding me who, regardless of their experience, have really stepped up and shown that they can handle themselves, so they make my job as that leader really, really easy. MN: What have you learned throughout your time at Cal Poly? 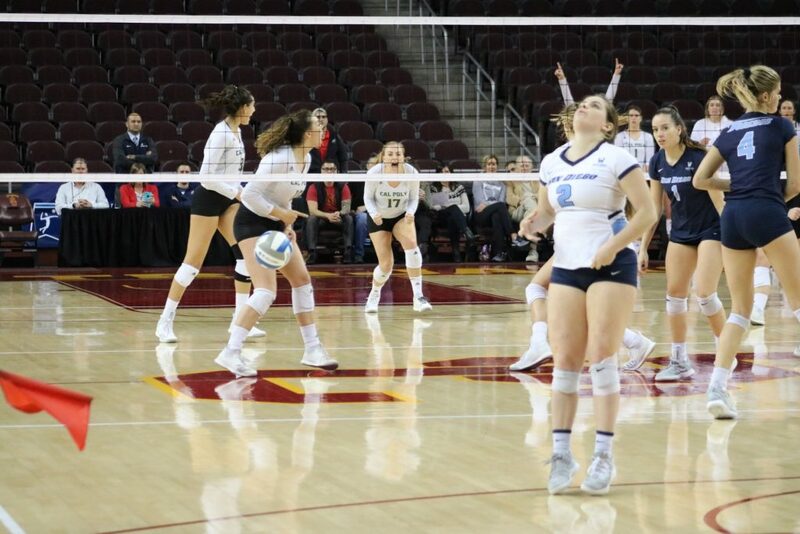 AVW: I’ve learned a ton from volleyball. Maya tripped yesterday in practice and it’s so special that even in this intense time, we have three days to prepare for this game that could be the last. Someone falls down and we’re still able to laugh and have that moment and just be friends and family on the court. That’s something I learned. It’s that special moment that not all teams get. MN: What is the best advice you’ve ever received? AVW: To find that even balance between holding people accountable and also being a good teammate and being there for people when they need it. 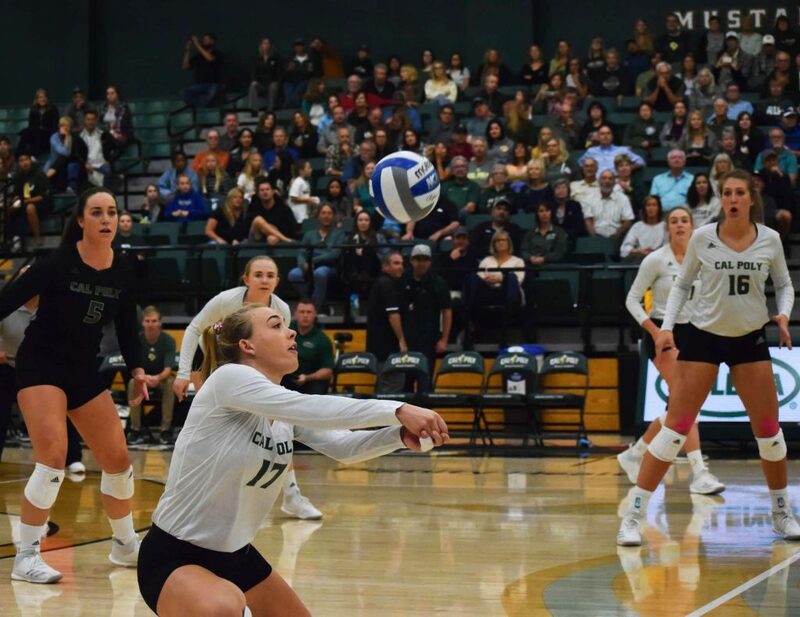 [Head coach Sam Crosson] has a really cool philosophy that “You’re a volleyball player, but you’re also a person.” I think that’s a really cool philosophy Cal Poly volleyball adapts and I’ve learned. MN: What advice do you give to younger players? AVW: To just trust your skill. I think the freshman label has a negative connotation to it and some people get timid and hide behind it. Avalon [DeNecochea] and Meredith [Phillips] have done an amazing job of stepping up and doing their jobs. Just continuing to grow and allowing themselves to play freely and be who they are is super special. I tell them to contribute as much as they can because you don’t realize how fast it goes by until it could be your last game. MN: Since it’s your senior year, are there any special thanks you want to give out? AVW: Thank you, [Crosson], for being an amazing coach. Thank you, [associate head coach Caroline Walters], for always pushing me. Thank you weight room staff for always making me strong. [Stephanie Uyeno] for keeping me healthy, my teammates for constantly supporting me in good and bad times, family for supporting me and being at every single game — it means a lot. Thank you, everybody. MN: Since it’s your senior year, what do you want to say to the Cal Poly and San Luis Obispo community? AVW: The community is the best community I’ve ever seen. To have a fan base like that, and know people and know their names and know their kids and really be involved in their lives and have them care about you, is something so special that you don’t receive at every single school. Keep being a good fan and know how much your support means to us. MN: What’s something you want people to know about you? AVW: Bubblegum ice cream is my favorite ice cream flavor.